The Patriotic Front says it will be going back to Roan Constituency to thank the people after yesterday’s parliamentary by election won by the National Democratic Congress. Party Secretary General Davies Mwila said deapite the result not going their way, they still receive it with thanks. Mr. Mwila who congratulated the NDC and UPND for their joint victory in Roan Constituency by way of a protest vote that has been handed to the Patriotic Front said the party shall re-group, re-strategize and re-launch itself in Roan. He told a media briefing that the party will carry out a postmortem of this painful setback and we will ensure that it regain its footprint in the Constituency. “Most importantly, we know the issues that led to this protest vote, we will go back and listen to ensure they are attended to. We will take time to listen to our people including those who have been continuously fed on deceit”, he added. “The people have spoken otherwise in the case of Roan Constituency. This is what democracy is all about; the people have a right to make their choice and we respect that”, Mr. Mwila said. Meanwhile Mr. Mwila said the PF is highly thrilled by its impressive performance in the 9 by elections that were conducted country-wide. Out of the 9 by-elections conducted country-wide, Patriotic Front won 6, FDD won 1, NDC got 1, And UPND also only managed to salvage 1 which Mr. Mwila said shows that the PF development agenda spearheaded by President Edgar Lungu continues to blow an unstoppable wind of change across former opposition strongholds. “We are deeply humbled by this development and we thank the people in areas that were previously considered UPND strongholds for accepting the PF Development agenda”, he said. The Opposition National Democratic Congress grabbed the Roan Parliamentary Seat from the Patriotic Front beating them by 3, 132 votes. 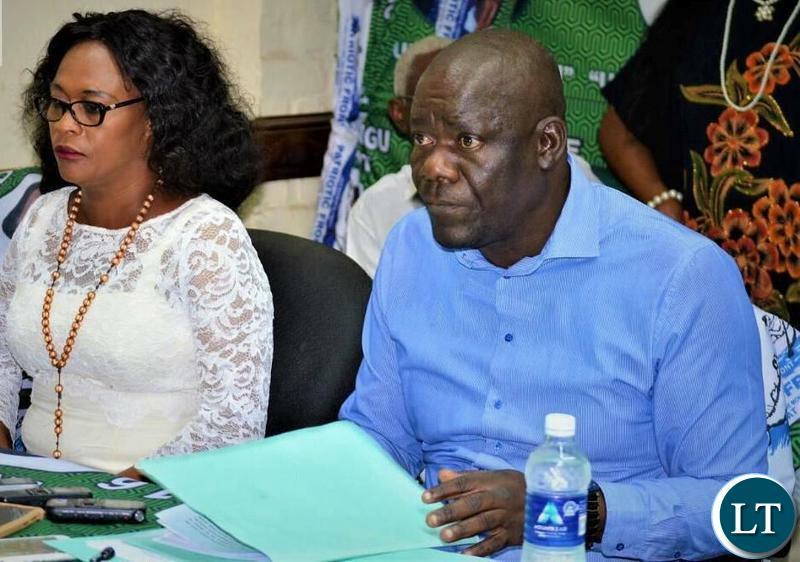 Fresh from Celebrating the victory in the Kafue Council Chairperson by election, the PF through its Candidate Joel Chibuye only managed 5, 533 votes losing to NDC’s Joseph Chishala who polled 8, 665. People’s Alliance for Change candidate Chama Mwansa only managed 210 votes in third position while UPPZ Candidate Morgan Banda came out fourth with 143 Votes. A total of 14, 701 votes were cast with 150 ballots rejected. Roan Constituency returning Officer Emmanuel Makulila declared Mr. Chishala the duly elected Member of Parliament in the early hours of today. Meanwhile, the Patriotic Front Candidate Charles Chalwe scooped the Bahati Parliamentary by election also held yesterday. Mr. Chibuye polled 11, 481 votes against his closest rival UPNDs Justine Bwalya who polled 2, 381 votes. UPPZ Candidate Clement Mwila was third with 1, 337 votes followed by FDDs Emmanuel Chanshi with 205 votes while People’s Alliance for Change candidate Isaac Lukwesa was last with 176. Mr Mwila you offered to resign if Kwambili party won. Aricans can not do so? JUST RESIGN OR HOW DO YOU FEEL TO GO AND LIE AGAIN TO THE PEOPLE OF ROAN? Nkandu Luo went and closed down CBU while the President was dancing on stage ‘kasaka kandalama’. Doesnt Luo know that some of the Lecturers and CBU students come from Luanshya and Roan. She deliberately chose to discredit the President while he was dancing ‘Kasaka kandalama’. Time to fire this Luo thing. UNZA should retire the Luo Lecture position in national interest. Mr Luo has too much negative energy and we cant deal with it right now. Kambwili has kicked you in balls bafikkala. The way PF lost in Roan is worse than how Davies lost his MP seat. If I was chairman of PF I would dismantle the all copperbelt PF team and hire new people. – Chairman of CB PF live in Luanshya and he voted for Kambwili. – The losing PF candidate is the Luanshya DC. – The all President and Vice-president campaigned in Roan. – the entire cabinet camped for weeks in Roan. – State house all shifted to Than. Then Mwila say will regroup? HOW? Congratulations to NDC. The truth is, the people of Roan have just dig a hole for themselves, what influence will ndc going to have in parliament to bring development to Roan? Whether you people on this forum agrees or not luanshya is now a died city. The marriage between NDC and Upnd is short lived. PF is technically still a strong party, look at Bahati winning margin between Upnd and PF as compared to Roan. Congratulations roan but l feel for you. He says he never said that he will resigned said he was not going to accept defeat but just re-group and go back to luanshya re-contest.Usa mutapa mu kanwa munsanu,nicinji ilomba? When I was watching BUFFOON CK campaigning I said to myself that Zambia has long way to go for the likes of Peter Sinkamba, Chipimo who talk about issues of govt spending, fiscal policies, clean energy, alternative farming crops etc …they only method they understand is that of BUFFOON CK where he is literally ridiculing PF like a bunch of children on a school ground. How do you send students home a week before the by-election on the streets of CB? You had just added a thousand more frustrated opposition youth agents with more time on their hands and a lot of energy to spare…surely Luo your arrogance has no limits…serves you right!! Tell ECL that generally some sentiments coming outa Kopala including your loss speaks volumes. The gossip on the ground shows people on the Kopala don’t think the PF isn’t living or ruling to the peoples expectations. CK’s manner of politicking would not have landed him that win but your lack of a real connection with the needs of the people. If people are not happy with your policies, vis taxes, fuel, cost of living, energy with Zesco’s rhetoric, water supply and cost, traffic police, Police service, poverty levels, cost of mealie meal and food, civil servants’ pay. Real cause for a working pro poor strategies. Watch Kopala and Lsk. You will be drained. Ababena bapuba, just resign on moral grounds if at all you have any.I feel like puking. Well said Hon.Davis Mwila.This is what democracy is all about.PF cant win everything.Yes “Loss ibaba”,but you have to sit down,talk to people on the ground and see what Zambians are not happy about.Correct those mistakes,put a smile back on Zambians and victories will be yours once more in 2021 even in Roan. I seriously think that Nathan Chanda,Joe Chibuye and others have offended Roan residents,so voters there protested! !BUT THE MAJOR ISSUE IS OUR ECONOMY IS IN A MESS,HENCE CORRECT THIS ECONOMY TO WIN BACK URBAN VOTERS!!! Who is the new SG? Next time don’t waste resources distributing Market fund K2000, relief food via choppers and fast private jet visits with unsavoury dununa dancing characters who never helped President Sata in 2011. Now you can resign and leave the SG seat to Mumbi Phiri. @kudos, Mumbai Photo would be awesome and fierce in the role but can she play dirty as that Rainbow Party chap used to? In any case Hon Mwila is good in the role. @Patriot maybe she has other strengths. I think she’s even dirtier than Wynter and Davis. Remember her foul mouth when she said she feels like vomiting every time she hears the name of (HH). She has a dirty mouth and probably dirty enough attitude to match Wynter and Mwila. Agreed, @kudos, she’s five blokes in one! I was thinking also of the abuse women in Zambian politics get, its sure tough, wonder if she wants that battle too! Just resign and regroup with your wife and children. It is an indictment on the performance of LUNGU’S PF GOVERNMENT, of which Mwila has very little input if any. Mwila is the CEO of their party and should be the first in the firing line. Having said this I hasten to add that the people of Roan have suffered a lot. I was in Mpatamato two weeks ago and I really felt for them. Houses are collapsing, people try to forget their misery by drinking dawn to dawn. These are the things PF should have been attending to. Ba Davies Mwila, don’t distract us from your promise: please resign from that position AND from politics. You have not resigned, that’s why you have been kicked out of Roan because you PF are completely unreliable. You promise something and tomorrow you change. And stop consoling yourselves with tuma electoral winnings you have collected over the past year because we know you have been rigging elections. This time your rigging machinery couldn’t cope with TWO simultaneous parliamentary by-elections at the same time, that is why you lost in one (Bahati) and won the other (Roan). The same way you were stretched with just two constituency by-elections, now imagine 150 constituencies in 2021!! Imwe tapali, 2021 kuya bebele. Congratulations PF, for a stupendous overall performance. As for Roan, never again allow a larger than PF character to setup his own mini PF govt in any constituency. Start working now. Secretary General please mobilise the PF party around vital mandate for 2021. SG must see to it that PF members serve PF in all constituencies. Please look into complacency and inertial setting in among PF. LISTENING and being concerned by people’s struggles is important. You need better civil servant salary resolutions. LISTEN. PF MUST START SUMMING UP it’s ACHIEVEMENTS AND BEATING ITS DRUM, so people can be brought round to the bigger picture than the small problems which are playing on louder. The small problems are wat concern the lives of the pipo their well being which is zero from this govt pipos livelihood which puts bread and butter on the table will determine 2021 not infrastructure. Beat drums how , when the economy is on its knees ??? Fixing the economy is the problem badala, but it is a problem beyond PF ……that is where you are fuuuked PF , the economy. Look at these foooooools …the whole govt camped in Roan, everything came to a standstill in govt..the role of the Head of State has being reduced to that of a mid-level rank and file political party mascot by this LAZY LUNGU. The other issue they should deal with is the wamuyaya third term. Zambian detest the third term syndrome. If you forget to include this in your strategy it will not help. Going back to loan to will not be the solution to the problems currently facing the country. Deal with corruption issues decisively. How could take Chitotela facing such serious corruption charges to people in Roan for campaigns?. He was even promising to tar roads there. You are really blinded. @ 10 yes can you imagine,taking corrupt Chitotela to Roan for campaigns,what do you take the people of Roan for??? Chitotela should not even be seen in the company of any serious Government entourage worth it`s salt.Infact please creat three bye elections in Lusaka so that we proove that you are men enough. The Roan Constituency results are so impressive. Wina Azalira!!!! Mwila is doing a good job. Such things happen. Can’t throw him out just because of Roan loss! Mr. Mwila offered to resign own his own, now he is talking about regrouping and strategizing? Just resign ba Mwila. Why they lost so badly in Roan? THERE WILL BE STAMPED IN PF COME 2021, YOU WILL RUN AWAY IN ALL DIRECTIONS AS POWER CHANGES FROM KAPONYA TYPE OF LEADERSHIP TO RULE OF LAW, TO DEFINE STAMPED FOR YOU IMAGINE YOU HAVE MANY GOATS IN ONE AREA AND IN THEIR MIDST YOU THROW FIVE DOGS, YOU CAN SEE HOW THE GOATS WILL RUN IN DIFFERENT DIRECTIONS, THAT IS THE STAMPED WHICH IS COMING YOUR WAY IN 2021. MUKAPASANGANA NGE MPANYA. AH AH… Resign kaili!! Regroup ifinshi? Who is going to push him when the President is a coward…the only thing he has is taxpayers money and useless positions to bribe people!! The only thing we are waiting to hear from you is your resignation. Lungu should also fire Luo, she’s too arrogant and not adding value to the party and government. The longer he keeps her the more damage she will do to his chances of winning in 2021. I wonder what value he sees in her. She is not a factor in Munali and in fact she dilutes whatever popularity PF has there. Mr Lungu sir you mean you can’t see this on your own? Strategise for what? People are waiting for you to resign bwana. Why cant people live by their word kashi. Whats wrong with resigning after promising people that you will resign if PF loses. Just leave and let Chitotela go there and campaign for PF. Atleast someone did not want to lose him like he did with CK. Some parties are cracking or showing signs of crumbling!!!! Roan was a no lose sit after all!!!! “Most importantly, we know the issues that led to this protest vote, we will go back and listen to ensure they are attended to…”, he added. …… Otherwise you Mwila and your PF are fast degenerating into trib.als and we cannot tell the difference!! Congrats people of Roan for your independence of thought, you have led the way. The best strategy would be for you is to HOLD A CONVETION at which the TOP ECHELONS OF THE PARTY including the Presidency should change!! If not, in 2021 it will be hard to convince the electorate that Lungu will change anything in 5 years which he has failed to do in last 7.5 years!! This vote is a message to you PF to restructure at the highest level!! I believe the PF has a Constitution which guides as to when a convention may be held, and loss of a parliamentary by-election is certainly not a circumstance requiring the holding of a convention. @24.1 certainly a convention is held to respect it’s constitution BUT what is it’s use if you have unpopular “sole candidates” with no prospects for change! ?If you think this loss in Roan is just any loss and business as usual then wait for 2021 with the same dancing President to see how he will be dancing PF’s farewell,away from the political scene!! The opposition are in luck……the problem faced by PF is the economy…….it is a problem beyond PF. You can dream about listening to bla bla bla , grass roots bla bla bla …..there is nothing anyone can do when there is a shiiit economy. Unless oil is found in Zambia, no amount of dancing on stage by lungu will fix the economy…..